A graphically updated version of Devil May Cry 4 with better shadows, enhanced lighting and tweaked/overhauled effects. Though this version doesn't allow for as high quality Anti-aliasing as the original version. Features 3 new playable characters (Vergil, Lady and Trish) along with new costumes and pallet swaps for Dante and Nero as well as the new playable characters (However Trish's Gloria and Lady's DMC3 costumes are only available through DLC). Uses autosaving, as opposed to save slots in the original Devil May Cry 4. Demon Hunter Bundle also available. Settings will sync too, except graphics settings. 16:10 resolutions are rendered in full, then scaled down to letterboxed 16:9 with visible artifacting. Check DevilMayCry4SpecialEdition.v4.0.CT with Cheat Engine. Engine caps at 120FPS with variable frame rate setting. Higher FPS when using ingame V-Sync setting on appropriate monitor. Open DevilMayCry4SpecialEdition.exe with a hex editor such as HxD. Change the name of mbGSDOF to mxGSDOF. Change the name of uDOFFilter to xDOFFilter. Change the name of uMotionBlurFilter to xMotionBlurFilter. Full, separate keyboard remaping for each of the five playable characters. Game doesn't support mouse during gameplay. Full, separate remaping for each of the five playable characters. Audio is available in Japan region only. 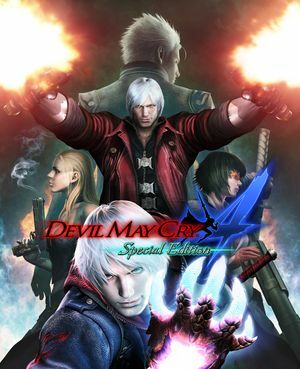 See Helix Mod: Devil May Cry 4 Special Edition. Check for Windows Update, where an update also provides improvement and fixes of DirectX. Some high end integrated graphics and modern gaming laptops with a discrete GPU may work but have not been tested, nor are they officially supported by Capcom. ↑ 1.0 1.1 File/folder structure within this directory reflects the path(s) listed for Windows and/or Steam game data (use Wine regedit to access Windows registry paths). Games with Steam Cloud support may store data in ~/.steam/steam/userdata/<user-id>/329050/ in addition to or instead of this directory. The app ID (329050) may differ in some cases. Treat backslashes as forward slashes. See the glossary page for details.